Vegas takes a gamble - Canadians are thinking of Vegas. Sure they are who isn't when it's still -30 outside and the wrong side of March. Sure some Canadians may be thinking of buying down south but it's a good way to get chauffeured around the city by a Realtor on your vacation. If Vegas if part of your long term goal and that property makes sense then buy it. But properties down there are a dime a dozen make sure none of those eggs are rotten. Note to environmentalist read The Canadian Press - An environmentalist writes that the slowdown in the oil sands is a great time to re-evaluate greener policies before the oil sands get going again (and they will). I hate to tell you but if you just read this article you'll see that $140 million has been dedicated to carbon capture. If I got to tell you the news then you are seriously out of the loop. Nine years ago Todd and I decided to take a year off from our respective jobs and take off to live in Japan. We still haven't left. I often forget the exact date we came, I think it was the 23rd of March, but I am reminded every year by the coming of the cherry blossoms. 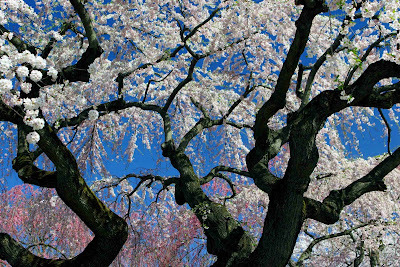 In my opinion the cherry blossoms are the best time of year solely because they herald the end of winter. Definitely May has better weather and the autumn has better food but something "tokubetsu" happens when the first blossoms appear. For those with the time and inclination here is a forecast of blossom dates. It looks like the festivities will start this weekend. Work life balance - Is it possible? Many of my corporate friends are bemoaning the fact that their overtime is now unpaid or "volunteer" in Japanese companies. By volunteer I mean they can stay if they want but if they leave it doesn't look good. When I came to Japan 10 years ago people were working crazy hours. Generally from about 9 to 9 or longer. One man I know commuted from Yokohama to Utsunomiya 2 hours each way every day. The other alternative being to live in a separate house in Utsunomiya during the week only seeing his family on the weekends. The extra income that overtime generated really helped fuel the economy but people really had no life. I wonder with all the free time entering people's lives if we will see some niche market opening. I've seen a lot of adult classes springing up perhaps to improve employ ability in this economy. It's About Time - Comedian and writer Dave Cohen seeks help from experts in trying to achieve a 'work-life balance'. He hardly sees his family - during any 'downtime' he is actually looking for more work. Years of freelancing and the current economic climate make it hard to say no to any offer. Alberta's oil sands projects are taking a break. For now. When we think of this break we have to think long term the next two to three years will be slow. Peoples views of short and long term cycles differ i.e 2-3 months, 10 to 20 years. A great way to get terrified is to think day to day and follow the media. "On the horizon, and not too far out on the horizon, we do see that demand coming back, and we need to use this time to prepare for it. I think business and government are working in that direction, but it is early going; the financial crisis only hit a short time ago," Art Meyer, senior vice-president for oilsands projects Enbridge. Basic fact is the need for oil won't go away, contrarily, it will increase dramatically, while the production of conventional oil is decreasing. That leaves the unconventional oil sands which the world is looking at to meet the estimated 45 billion barrels a day shortage that is looming in the future. We need to make the oil-sands cleaner to be more appealing, the technology is there. Cleaning is crucial and in turn will slowly push up the amount of jobs in the area. This means more housing needs which means a return to positive increases in housing prices. Because of Canada's conservative nature we were able to make it through while American banks are collapsing. You'll hear about Canada's sub-prime crisis but our banking system is so different and because our loans are recourse loans we simply can't just walk away from our mortgages. Sure we were exposed but NOTHING like what happened down south. So many U.S. banks have collapsed or shrunk that 4 Canadian banks are now among the continents largest banks. It reflects globally that Canada is a safe haven during times of economic uncertainty; which bolsters trading with Canada and of course positively influences our economy. "Canadian banks have remained profitable, outperforming their peers, because of tighter government restrictions on lending and capital requirements," Bloomberg in a report on its website. Even Barack Obama has praise for our banking system. We are more than pretty good. We are great. Listen to the whole audio file if you are interested but it is the last 10 minutes of where the price of oil is going that interest me. This week's Political Panel includes former Conservative cabinet minister Rick Orman, former Liberal Edmonton MLA Mo Elsalhy, and the Treasurer of the Alberta New Democrats Erica Bullwinkle. Bonus Bad! In the wake of the AIG uproar in the U.S., Alberta's opposition parties engineer the elimination of bonus pay for civil service managers. But it raises the possibility that there could be more on the chopping block in the near future. Bye Bye Rebate! Citing both financial and environmental reasons, the province puts an end to its six year old natural gas rebate for consumers. Housing the Homeless! The government rolls out its plan to end homelessness in Alberta by 2019. All it needs is money. In his business commentary, Gary Lamphier sees reasons for optimism in the recent rise of oil prices. Headlines scream Alberta is shedding jobs. With an unemployment rate of 5.4% Alberta is doing better than many countries in the world including Canada which hit a 7.7% unemployment rate in February. While Alberta gained 3,300 jobs in January 129,000 were lost across the country. Numbers look scary till you get the full story. Unemployment numbers increased in resource based jobs partially due to seasonality and to some projects being put on hold. Not all categories are being hit. In fact there are and will be shortages in many industries looming in the future. Tailors, dietitians, nutritionists, architects and beekeepers (yes beekeepers) are looking at labour shortages in the near future. Alberta is coming from a place where teenagers were dropping out of school to go work in the oilfields and make more than their parents. Billboards everywhere had staff needed signs and the province showcased itself across the world as the place to move to for work, low taxes and great quality of life. Want to see how house prices across major Canadian cities have fared over the the last 2 years? Take a look at this interactive map of real estate statistics from across the country, including home sales, average prices, apartment rents and vacancy rates. 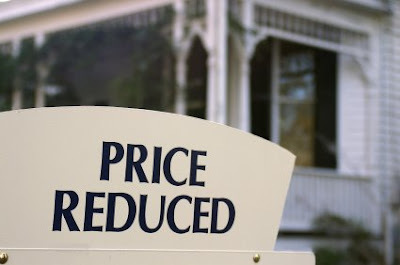 Home prices dropped 1% in 2008 and are expected to drop another 10% until 2010 when they will start to pick up again. As an investor house values are only important when you sell. Therefore timing when to sell is crucial. The best thing to do is not sell now unless you absolutely have to. Take steps to reduce your costs and make your properties positively cash-flowing. Best of all now the buying signals are phenomenal! It's a buyer's market with incredibly low mortgage rates. Anyone who has made a lot of money in real estate will tell you that buying when markets are low, during times of crisis is the smart man's game. My aunt forwarded this to me. I know it is quite late; now news a month old is ancient history. However, it is a good read and pretty bang on. bailouts or government intervention in the financial or mortgage sectors. system the healthiest in the world. America's ranked 40th, Britain's 44th. size; the others have all shrunk. culture, but it is also a product of old-fashioned rules on banking. up on a bad mortgage, it's mostly the bank's problem. In Canada, it's yours. own homes. And the rate of Canadian homeownership? It's 68.4 percent. 78 in the United States; "healthy life expectancy" is 72 years, versus 69. North America's largest car-producing region. shores thousands of talented students who want to stay and work here. full-time, legal resident of Canada. work, innovate and pay taxes for the rest of their lives. for new rules for financial institutions that would reflect its approach. This strikes me as, well, a worthwhile Canadian initiative. Interesting times. This year and into next will be the good news, bad news routine. Until we (Canadians, Americans, consumers...) can make up our collective minds as to whether the economy is crashing or recovering we'll fluctuate from elation to despair. I read an interesting article about the psychology of the Japanese economy called 'Crisis of the Mind'. In a nutshell it is a change of thinking and implementation of new ideas that will decide how long or short, deep or shallow the current 'correction' will last. Here is an article titled 'Alberta To Shed Thousands of Jobs' - pretty scary title, but if you read the article you'll see that the Alberta unemployment rate is actually below 5%, which is incredibly low! Compare that with many European countries to get a sense of what is truly real. 5% unemployment rate is hardly indicative of a 'severe' recession. And - look at the mortgage rates - lowest mortgage rates in Canadian history. These are fantastically strong buying signals; time to take advantage of whether it be an investment property or residence in a Top 10 City. Other countries around the world are in serious economic turmoil but Canada is blessed to have the most stable economy. Among Canada's provinces Alberta is the most balanced with the healthiest economy and growing infrastructure to support population/investment growth. You may read the the oil sands are bust and all the projects have stopped but this is not accurate. There are still over $170 billion projects underway only $90 billion have been delayed. Don't kid yourself, the need for oil is increasing while the production of oil is decreasing. Until the world finds a way to make a solar car (or any product) without using any fossil fuels, that need will become more and more prevalent. "When I look down the road, it’s going to be grimmer than I thought it would be for the next year, year-and-a-half. This is going to be an intense downturn," "there’s no better jurisdiction to be located in than Alberta," "At the end of the day, so many fundamentals are positive in the case of Alberta, the best strategy is to treat this as short-term." Michael Percy, dean of business at University of Alberta. The Alberta economy will be back on track leading the nation as oil prices improve and companies start pumping money back into the oil sands. We've been investing in real estate for almost 10 years now and across 4 provinces. I can tell you from experience the most important thing you can do once you've picked your area and property is to find a good, no make that great, property manager. It's a lot harder than you think. We've had some outstanding property managers and some unbelievable ones (forging the tenants welfare cheques ranks among the worst). Todd took the time to write a "How To" article specifically for those who have income property and want to make sure their asset can still produce cash-flow in any economic environment. "When vacancy rates increase you want to make sure that your units aren’t the ones that are empty. There are two ways to do that; one is to rent high quality units at excellent rates to long term tenants and the other is to keep your property manager on their toes. We have investments with a low entry point and positive cashflow. There really are a lot of great properties in which to shelter your capital. Economic Turmoil or Financial Opportunity? Don't Run From Today's Economic Turmoil. Take advantage of it by tapping into the systems and research wealthy Canadians are using to create financial security during these times of uncertainty. "The Future Of The Canadian Economy Is Uncertain!" Extended Recession, Depression or Opportunity? It All Depends On Your Location & Your Perception! University And Getting A "Bachelors Degree"
Employers not appealing to Gen X and Yers - "The labour market in Edmonton and Alberta is tight as I've ever seen it in 10 years in this industry, and if you can't attract this next generation of upcoming leaders, the Gen X and Gen Y, then you as an organization are going to have significant challenges moving forward." Mike Corbett, vice-president, Edmonton, at David Aplin Recruiting. Poll results buoy Alberta minister - "Fifty-seven per cent of respondents in The Canadian Press Harris-Decima survey said there are more benefits than drawbacks to the oil sands, while 35 per cent reported the reverse. A majority of those surveyed in every province except Quebec supported the benefits, with Alberta leading at 70 per cent. "This data tells us a lot of Canadians do see there is benefit to the oil sands that goes beyond Alberta," Jeff Walker, senior vice-president with Harris-Decima, said yesterday. Energy boost welcomed - Mel Knight announced yesterday that the government will offer a maximum 5% royalty rate for new oil and gas wells that begin production between April 1, 2009, and March 31 next year. The province will also offer a drilling royalty credit of $200 per metre drilled for new conventional oil and gas wells, on a sliding scale based on their production levels from 2008. Albertan consumers still confident - "If you look at Alberta relative to itself from a year ago, then we're probably seeing some of the largest slowdowns in Canada," said ATB Financial economist Dan Sumner. "But if you look at Alberta now compared to everyone else right now, we're still doing OK. Retail sales per capita are still by far the highest in Canada." People in other countries are lining up to get into Canada. While their economies are suffering and unemployment is rising, Canada is begging for workers at immigration trade shows in the UK. Sure the Canadian economy is feeling the effects of the global economic crisis but when compared to countries like Iceland, America and Scotland we are a beacon in the darkness. Alberta especially is attractive due to its low taxes and high than average salaries. This is a win-win situation for real estate investors because when the long-term migrants first come they rent properties and when they decide they love Canada/Alberta they buy real estate.